Apple’s mobile-device user interface has made it so much easier to access the Internet compared to other mobile devices that its iPod touch, which isn’t even a mobile phone, beats out all mobile phones except the iPhone in terms of volume of Internet access, according to data released by AdMob. The iPod touch doesn’t have a cellular connection, but users can access the Internet via Wi-Fi. It generated 6.7 percent of mobile traffic for AdMob in February. That’s less than the 11.2 percent traffic generated from the iPhone, but more than any other mobile phone. Motorola’s Razr came in third place, with 2.9 percent of AdMob’s traffic. AdMob defines a smartphone as a device that runs a complete operating system, such as Symbian, Windows Mobile, or Android. By individual device, the Nokia N70 came in second place among smartphones, with 7.1 percent of requests. Windows Mobile phones didn’t make it into the top 10 smartphones, which was otherwise split among Research In Motion and Nokia, with the Palm Centro at number nine with 2.6 percent of the traffic. In the U.S. the results were, predictably, different. Nokia didn’t make it into the top 10 smartphones accessing AdMob’s network. The iPhone generated 49.5 percent of traffic in the U.S. for AdMob, followed by the BlackBerry Curve, the BlackBerry Pearl and the Palm Centro. The Android phone came in fifth place, with 5.2 percent of the traffic. AdMob did not count the iPod touch in those results since it does not categorize it as a smartphone because it doesn’t have phone capabilities. 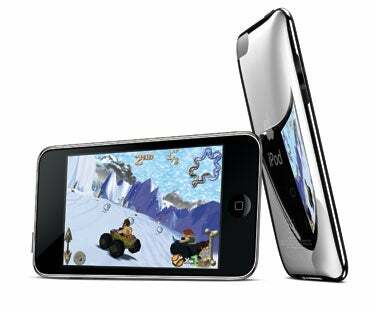 AdMob did include the iPod touch, however, in its overall list of handsets that included smartphones and regular phones like the Razr.